I never knew a bottle of clay could teach me so much. Hi, my name is Christina - and I'm a hot mess. Because my brain is literally Chrome with 82 tabs open, I've developed some really bad habits in the name of multitasking and, "oh s#! * let me do this" - and it kinda sorta drives me crazy. It definitely drives Samuel crazy. But that's another story for another time. The end result of my Chrome-browser-ready-to-crash brain is that I've always got 52 things "in process" around the house - mini photo studio in the living room, meal prep halfway done in the kitchen, bathroom that's a clusterfudge of products because I'm doing my hair, and of course - my desk is basecamp. On any given day, you could look at my desk and wonder - how do you think straight here? How do you get anything done? How Sway? 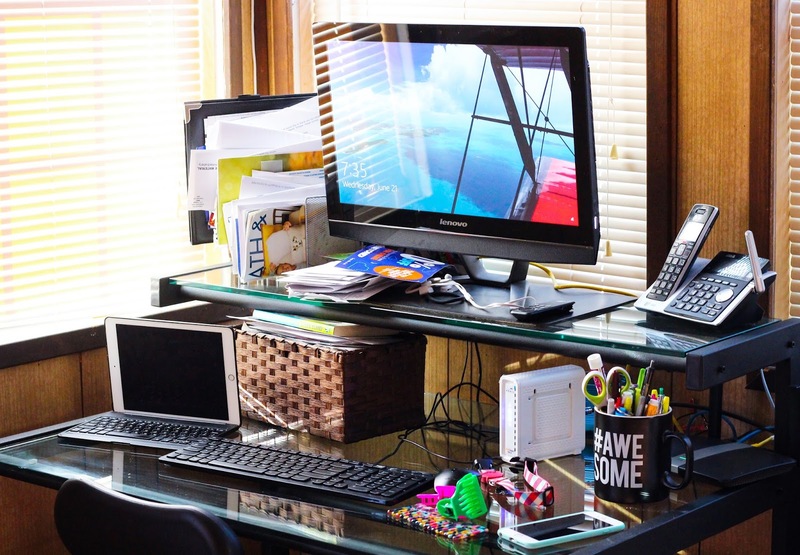 In addition to blogging and photography, I work my real life full-time job from home - so my desk is pretty important. At least, it's supposed to be. I reached a literal breaking point with the corner of my office that's dedicated to my bread and butter - and something needed to change. I'm not a neat freak by any means - but I have a threshold for clutter that I always seem to come within an inch of reaching. Then it get stressful - and stress is no bueno. 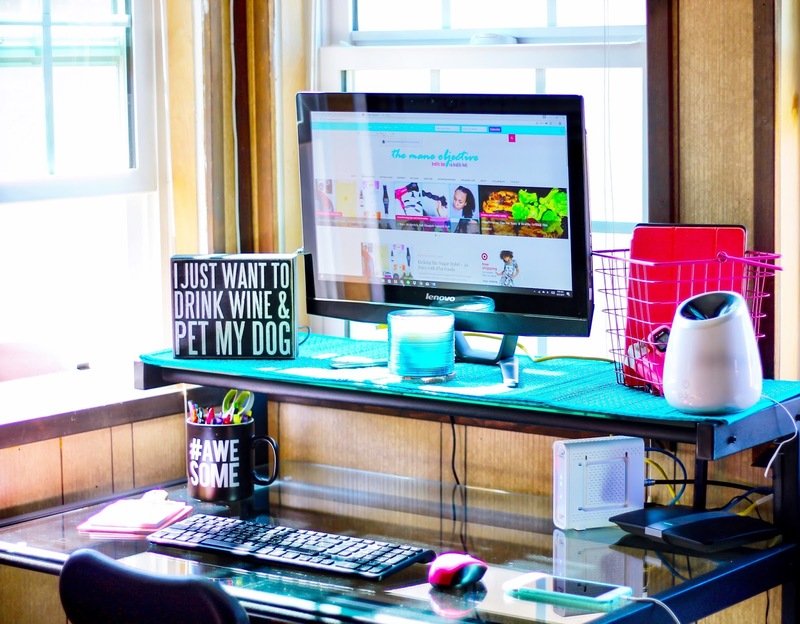 Inspired by Soultanicals Master Hair Cleanse Curl Detox, I decided that it was time to "detoxify" my workspace from clutter, distractions, stressors, and pretty much anything that prevented my flow of clarity and creativity. I also decided that I needed to at least "enhance" my workspace with a few pops of color to make it feel less sterile and generic. It's not quite time for a full-on remodel, but I definitely used the spirit of Master Hair Cleanse Curl Detox to help me make the most of what I already had around the house. Missing: sparkling water cans, a Hydroflask, empy coffee mug, 3 vitamin bottles and Bailey's toy. Now mind you, this is on a good day. On countless other days, there's empty water bottles, vitamin jars, more hair products, and sometimes even a pair of shoes. Yes, I'm incredibly guilty of treating my workspace like just another surface to drop stuff on - while somehow still managing to get work done. On the left, that brown bin is full of old Bed Bath & Beyond coupons, unopened bills (because everything has an app these days), dry erase markers, and at least 2 books. The metal organizer on the top shelf suffered the same fate. Both pieces became a place to just stick stuff. Don't even get me started on the landline phone that I don't use unless my iPhone is about to die, or I can't find it. And the cords everywhere. I can say with absolute honesty that only a handful of items in my workspace actually served a purpose, or contributed positively to my work. Open space helps me think clearly and minimizes distractions. I CAN BREATHE! It's crazy what you can do with a little ingenuity and a few things lying around the house. The first thing I did was find batteries for my wireless keyboard and mouse, to cut down on the cord clutter. To punch up the color and accentuate the area with "my" style, I removed the black computer mat and replaced it with a turquoise and bamboo runner that I had originally purchased for my dining room table. Long story short, the runner doesn't match the chairs, and the poor thing ended up in a cabinet somewhere. I pulled it out, folded it in half, and now it fits perfectly. Because I clearly have a thing for turquoise, I brought another unused item out from hiding - my three-wick candle from Bath & Body Works in the fragrance Iced Vanilla Woods (it's one of my favorites). I also pulled the pink metal basket from my storage closet, and decided to put it to use as my "electronics bin" - holding my iPad, keyboard case, and charging cords for all my electronic doodads. Next to the pink basket is the diffuser I bought several months ago from Home Goods after I got Bailey (we are definitely #TeamHouseCantSmellLikeDog). 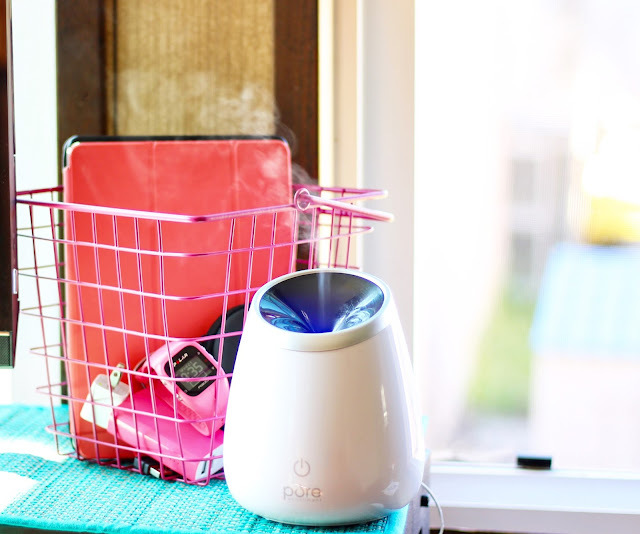 Typically the diffuser sits in a corner somewhere, but I was inspired by the earthiness and essential oil goodness of Master Hair Cleanse Curl Detox to bring it onto my desk. High capacity, multi-color LED, auto shutoff + more. Grab yours here. This particular combo gives me energy, clarity, and inspiration with a hint of tranquility and balance.I run it for an hour or so, then shut it off and allow the fragrance to spread throughout the house. I'm so happy I took the time out to care more about the space I work in. I didn't think de-cluttering my desk was an important step in self care, but it is. Since the de-clutter and mini remodel, I've been on a roll - my day is more organized, I think and act with more clarity, and I'm able to sit down and focus on each task. Organizing my desk has even inspired me to get better with organizing my time. Master Hair Cleanse Curl Detox is gonna be clutch for summer. 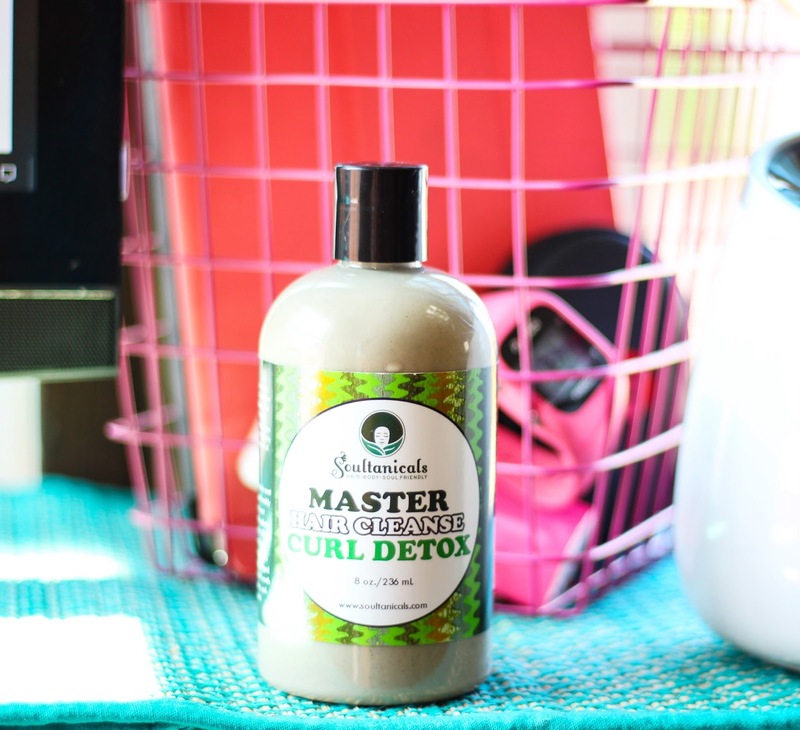 The Master Hair Cleanse Curl Detox by Soultanicals is an aloe-based bentonite clay blend that's sophisticated, earthy, and packs a curl detoxifying punch. It contains burdock root, sea kelp, nettle, blackstrap molasses, hemp seed, essential oils, and more. The blend is super smooth and almost feels like a conditioner, consistency-wise. I used Master Hair Cleanse Curl Detox in place of shampoo and co-wash. 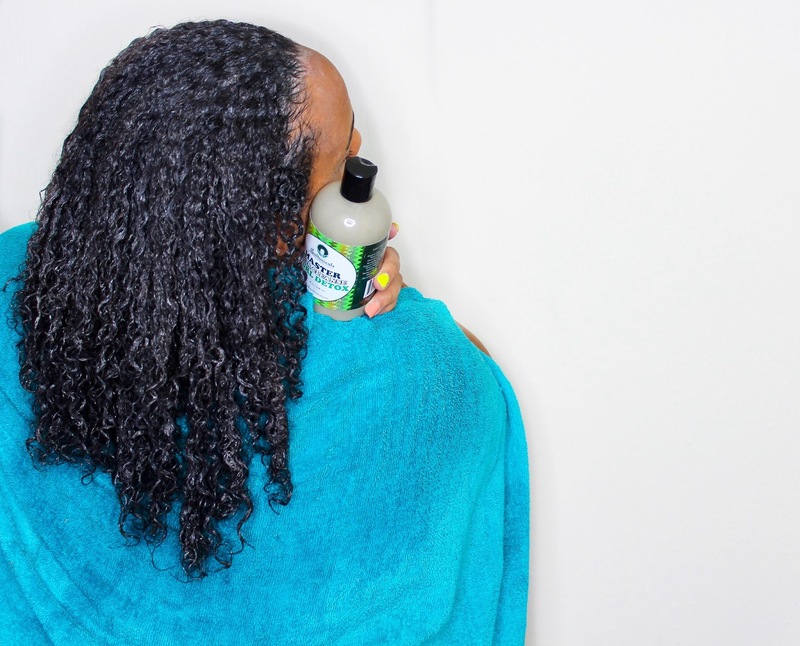 I rinsed my hair to begin the process of removing product build-up, then went right into generously applying the Curl Detox throughout my hair and directly onto my scalp. After my hair was thoroughly coated, I began to lightly finger detangle and massage the clay into my scalp. Per the instructions, I covered my hair with a plastic cap and used my Hot Head Thermal Cap for better penetration of ingredients. The bottle says to leave it on for 30-60 minutes, but I definitely left that jawn on for almost 3 hours (I was busy, lol). No harm no foul - after I rinsed, my hair looked and felt AMAZING. My scalp, even better. I went right in to deep conditioning after and that was it - a two-step wash day. You guys know I have scalp psoriasis, and anything that can help alleviate the itching and flaking while not zapping moisture from my strands gets a gold star from me. 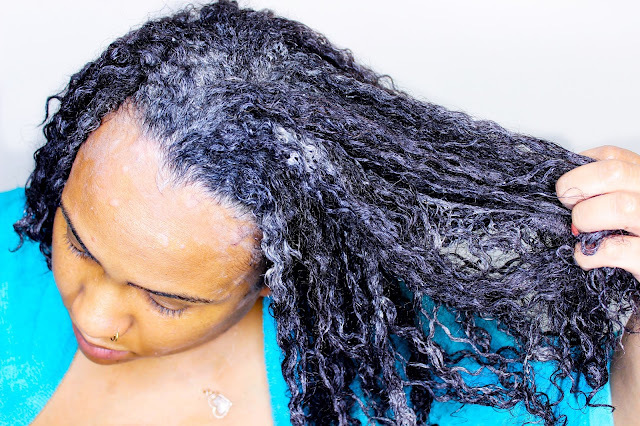 Master Hair Cleanse Curl Detox worked like a charm for lifting and removing debris from my scalp and hair , and it also gave me a serious frizz-fighting, curl enhancing boost, thanks to the bentonite. It had enough slip to detangle, and left my hair super soft. I'd swap this bad boy for my mud rinse any day. Zero frizz. All the curl clumpage. YASSSSSS. Sometimes, it's not about getting new stuff. Just take what you already have, and work with it to make things better. I hope you all enjoyed my reflections on self care day 1 of 7 with Soultanicals. Stay tuned for day 2 tomorrow! How do you reinvent your personal space at home? Let's chat in the comments below!